LET’S TALK ABOUT YOUR VACATION! 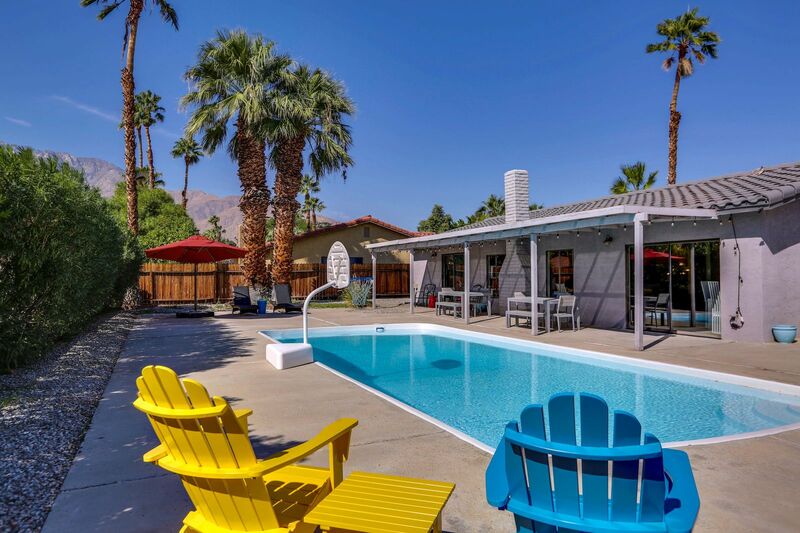 Poolside Living is an amazing 4-bedroom Villa in the heart of Palm Springs. 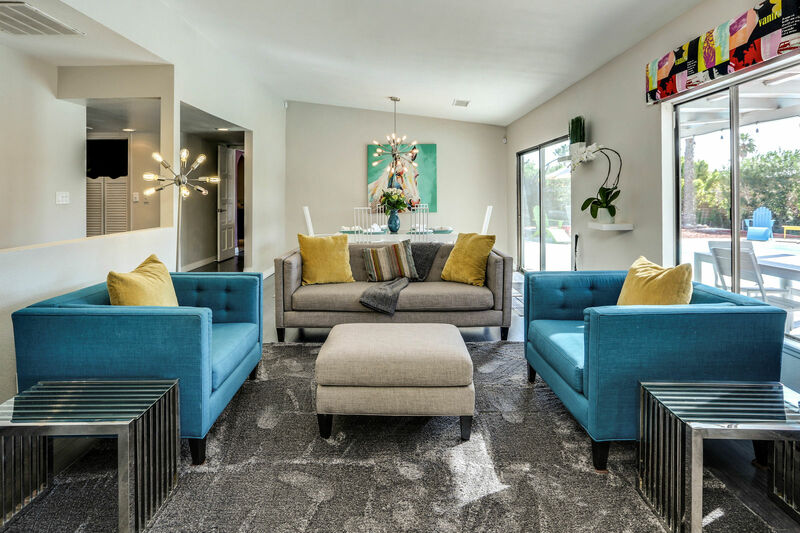 As soon as you walk through the door, you'll be surrounded by the midcentury styled décor that is so reflective of that time period. 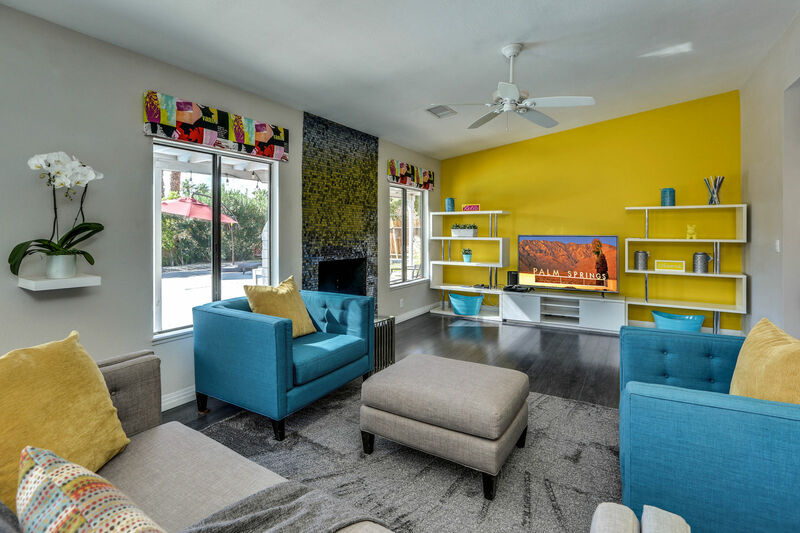 The interior of this house will surprise you. 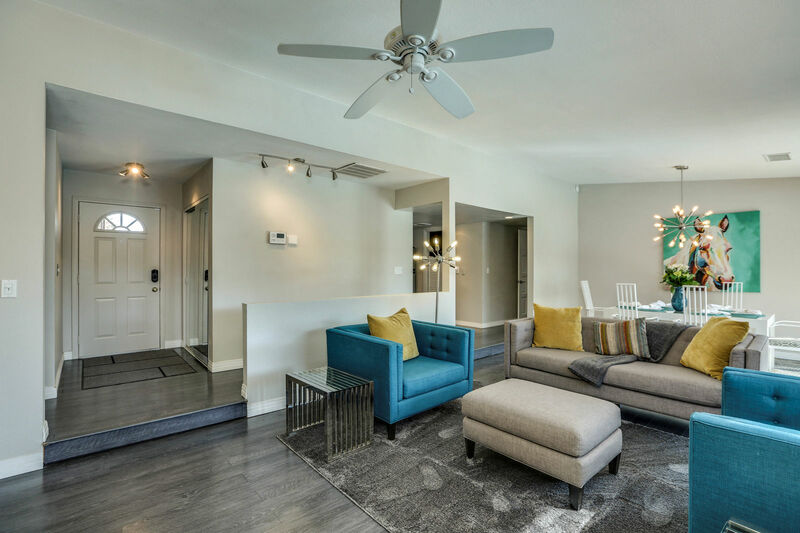 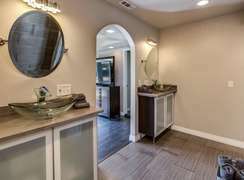 As you enter, you are met with stunning gray, sleek wood flooring that leads your eyes to the most beautiful fireplace/wall décor in the living room. 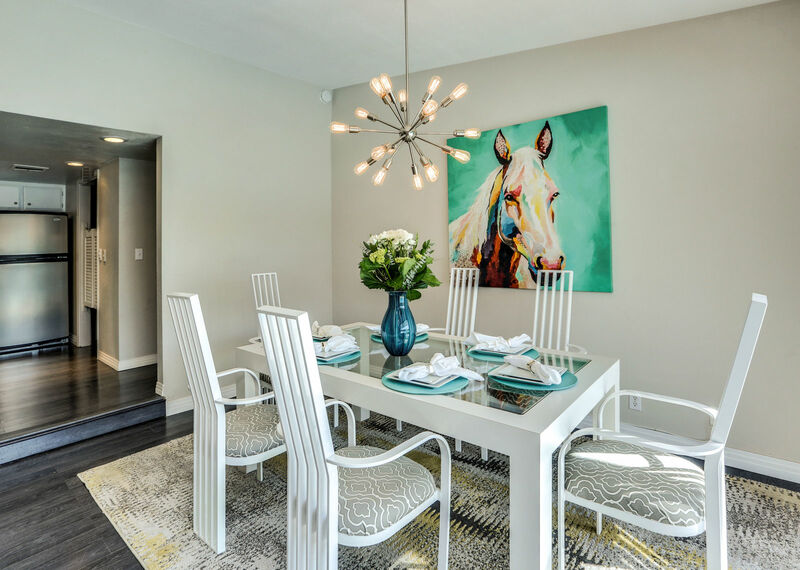 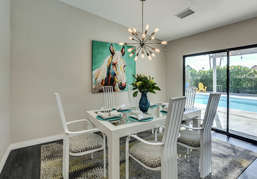 The classic modern furnishings throughout the house invites you to adore every detail of this house. 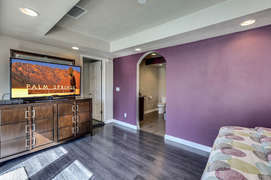 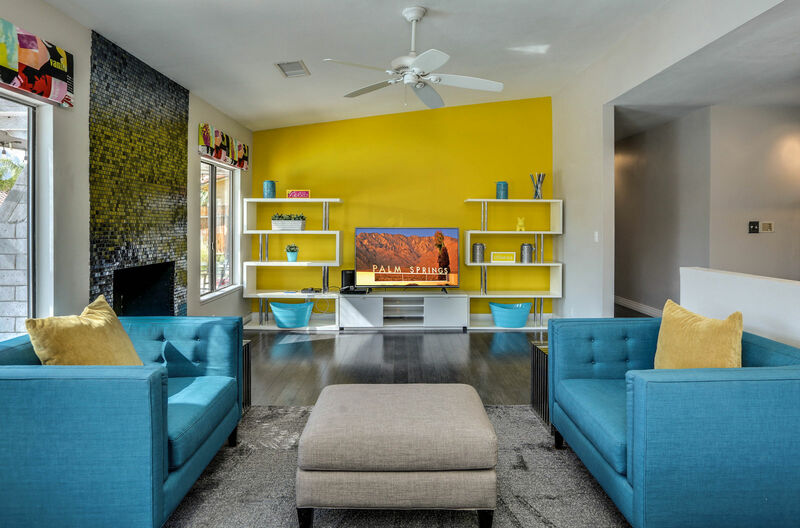 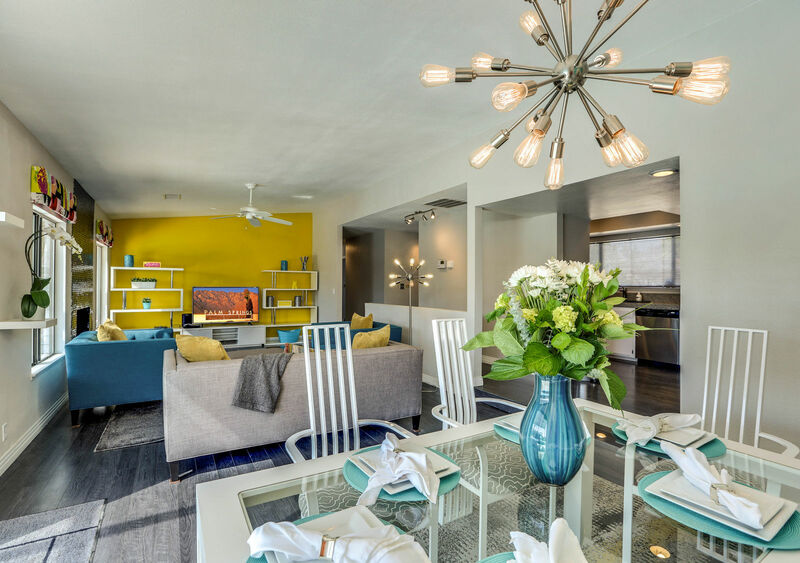 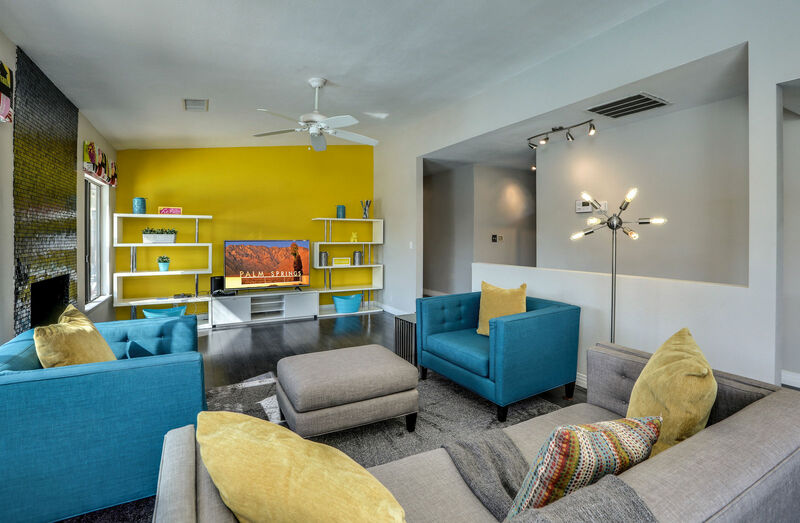 There is an open living room and dining area so you and your guests can sit and watch the 60’ TV, chat, dine and enjoy everyone’s company together. 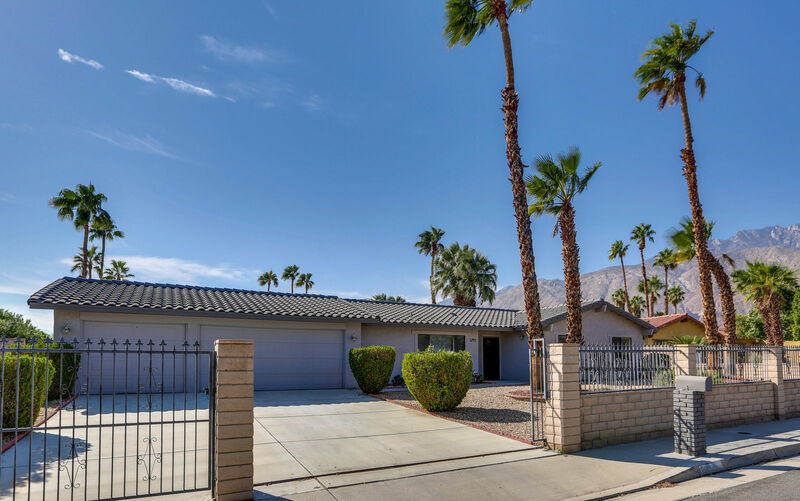 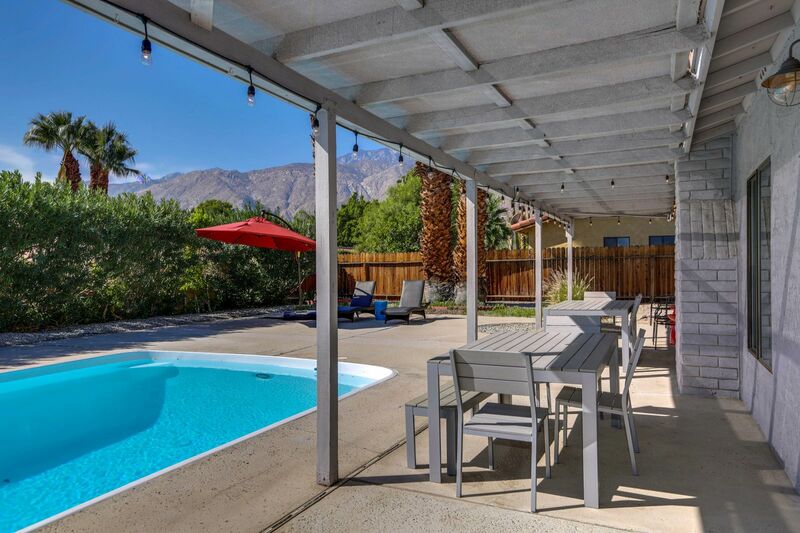 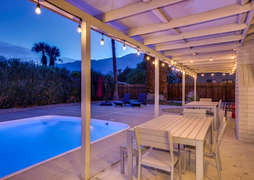 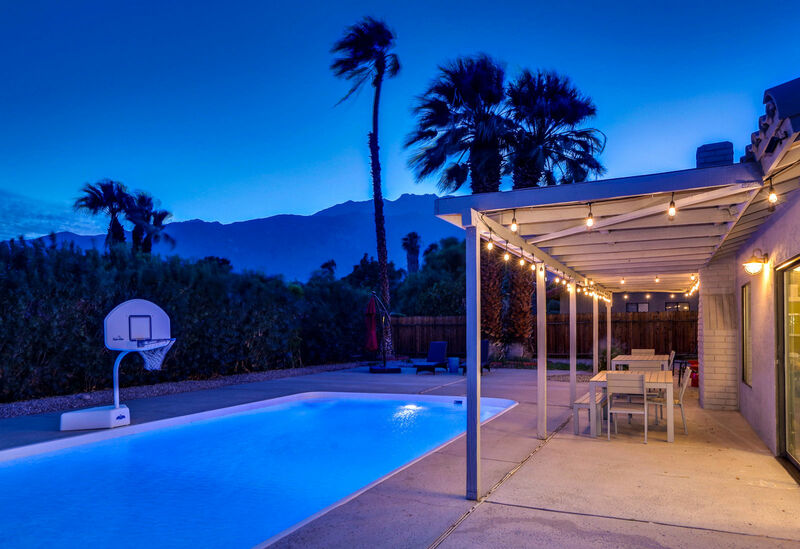 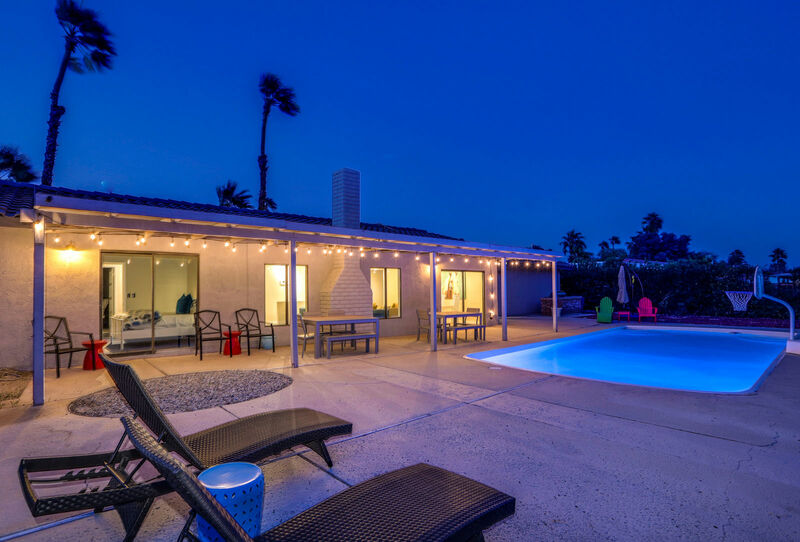 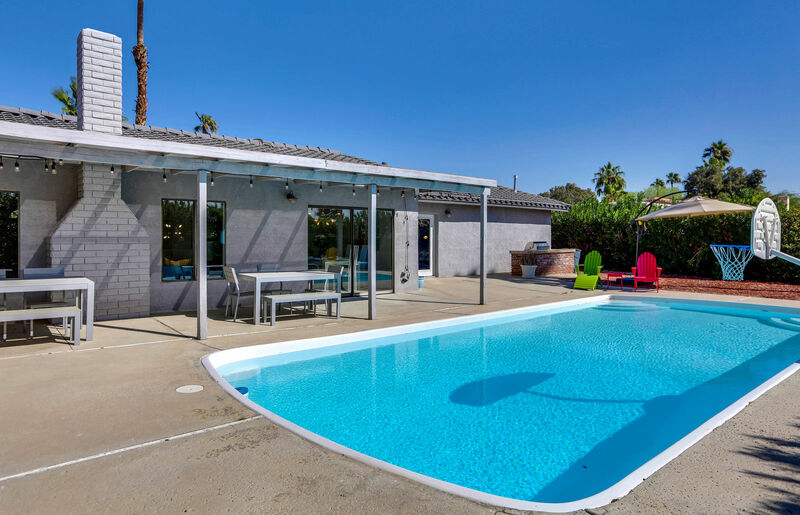 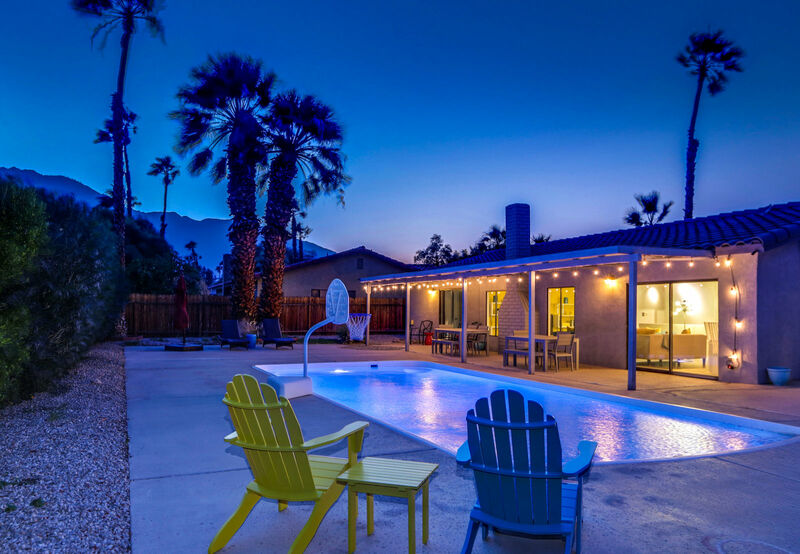 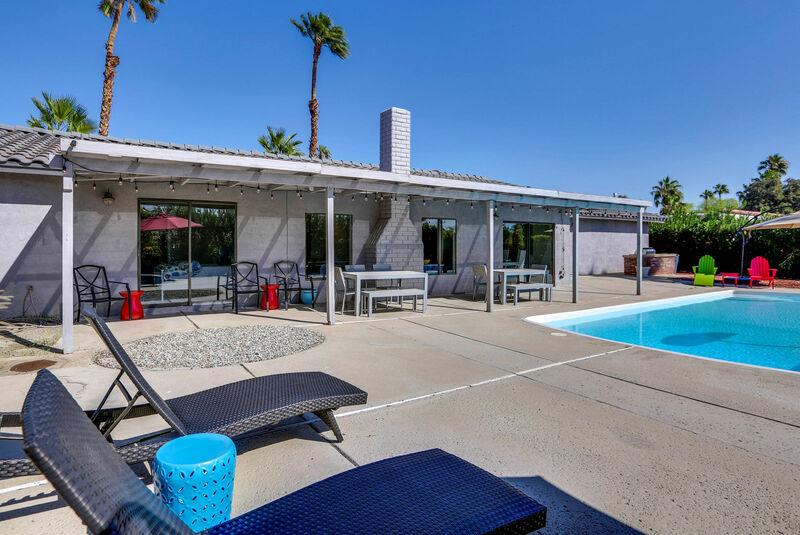 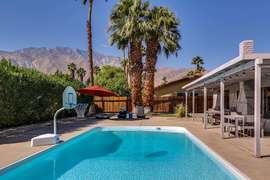 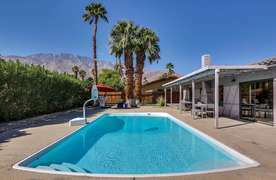 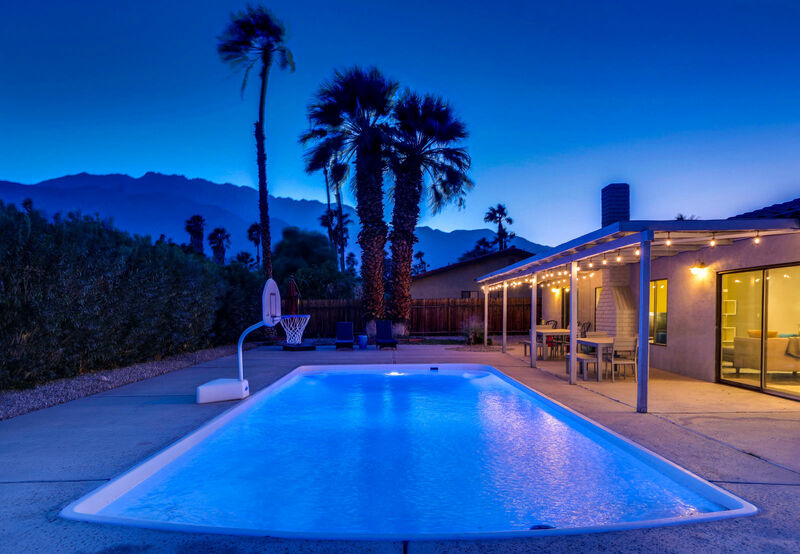 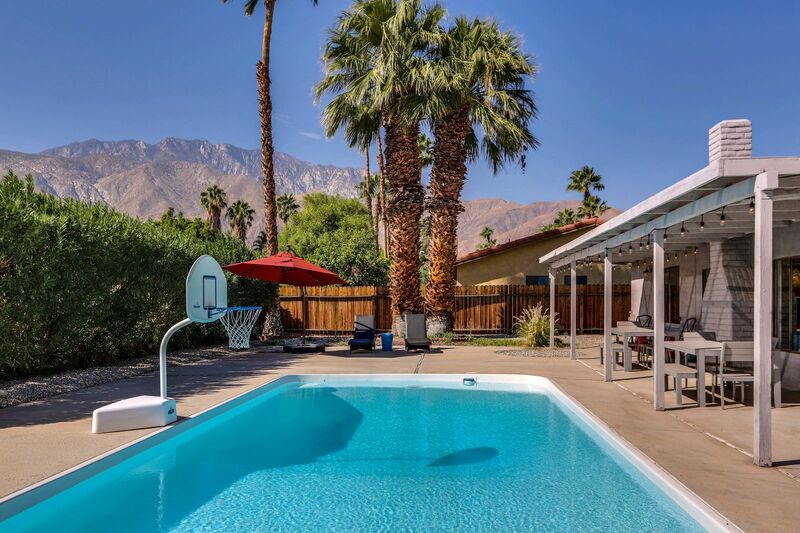 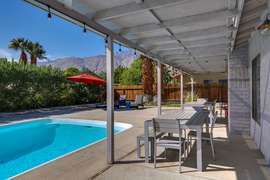 This 4-bedroom, 3-bathroom Palm Springs vacation rental will easily sleep 8 people. 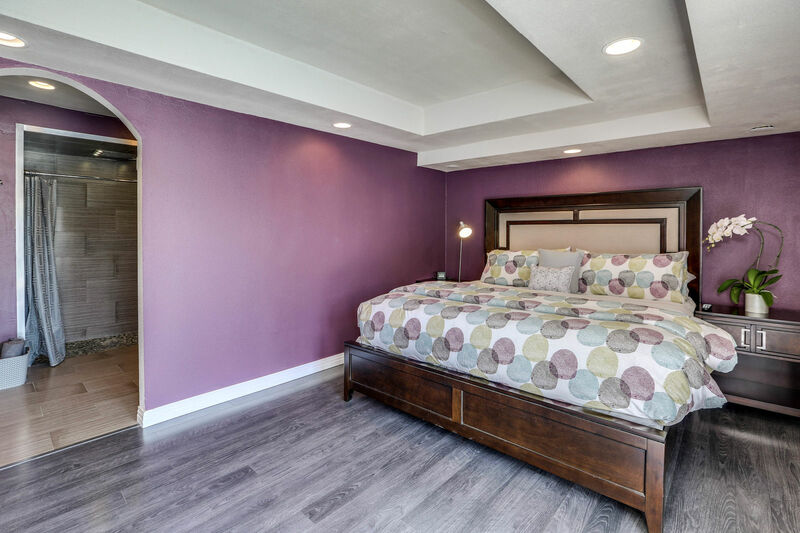 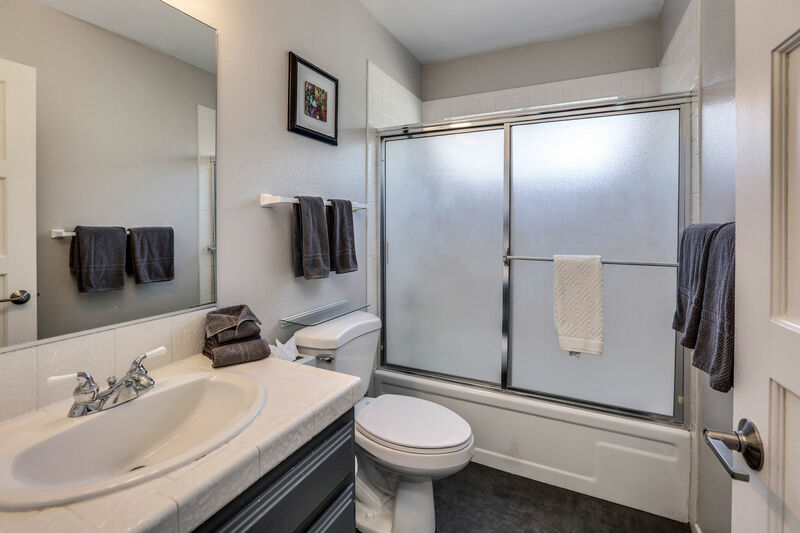 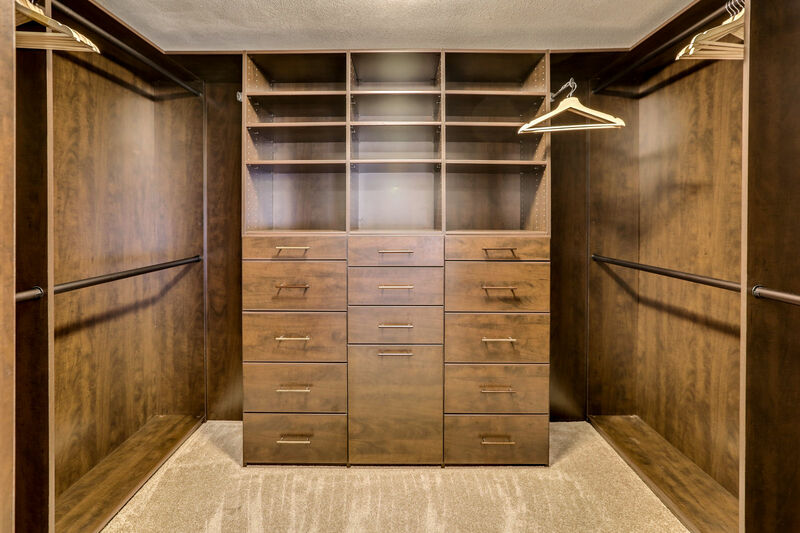 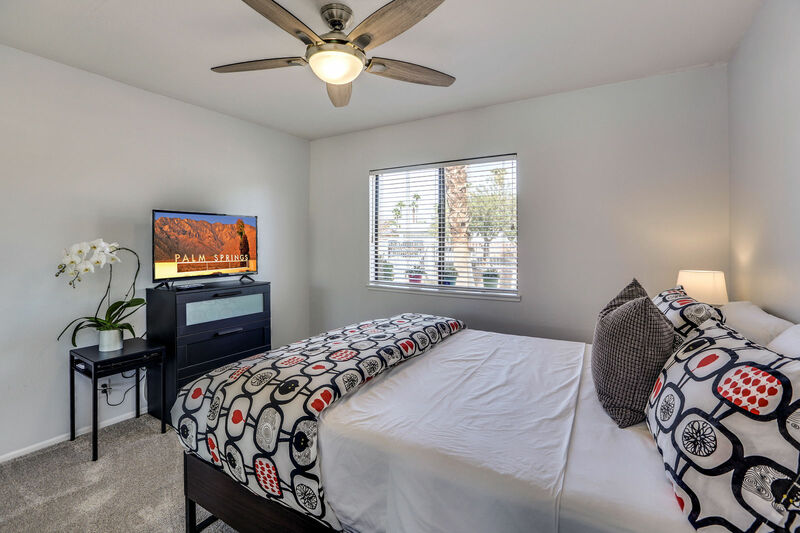 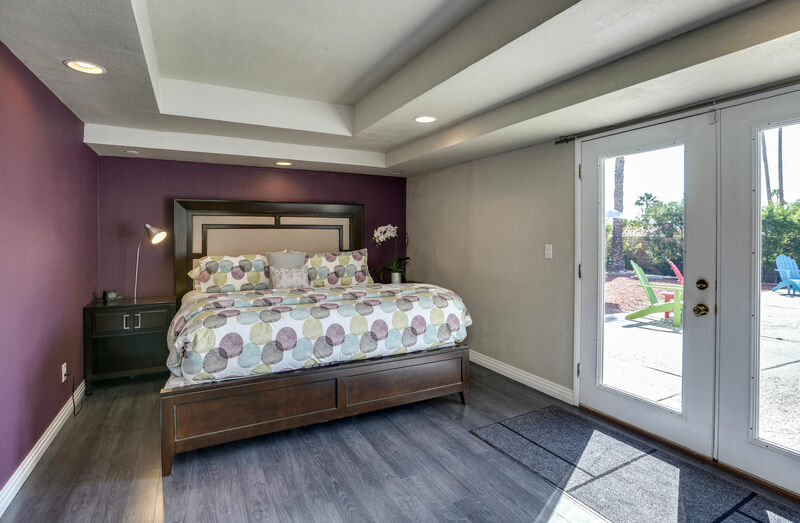 The master suite has a comfortable king-sized bed with a 55’ TV, a closet that you will envy and a bathroom that is absolutely stunning with amenities that will make you want to take selfies daily. This bathroom also has beautiful dual sinks for your use. 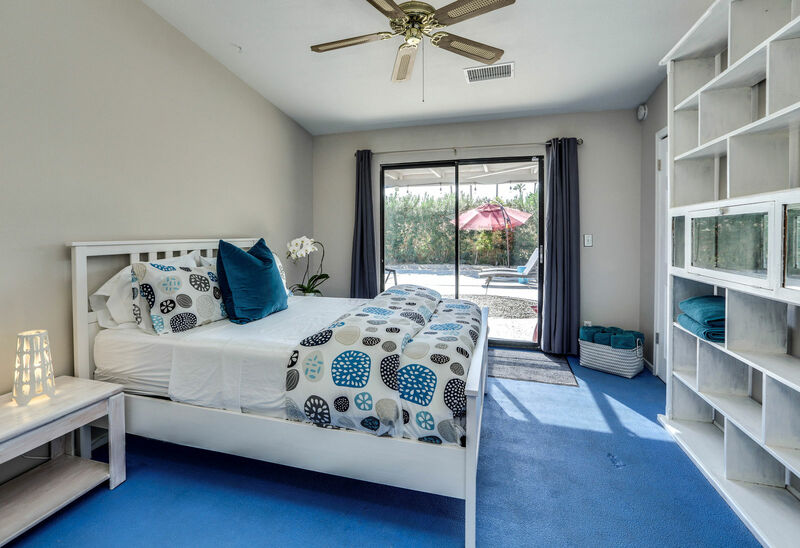 The second, third and fourth bedrooms have a queen bed in them and a ceiling fan. The second bedroom also has a 40’ TV. 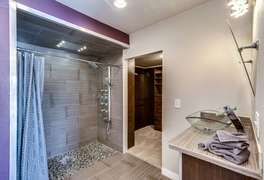 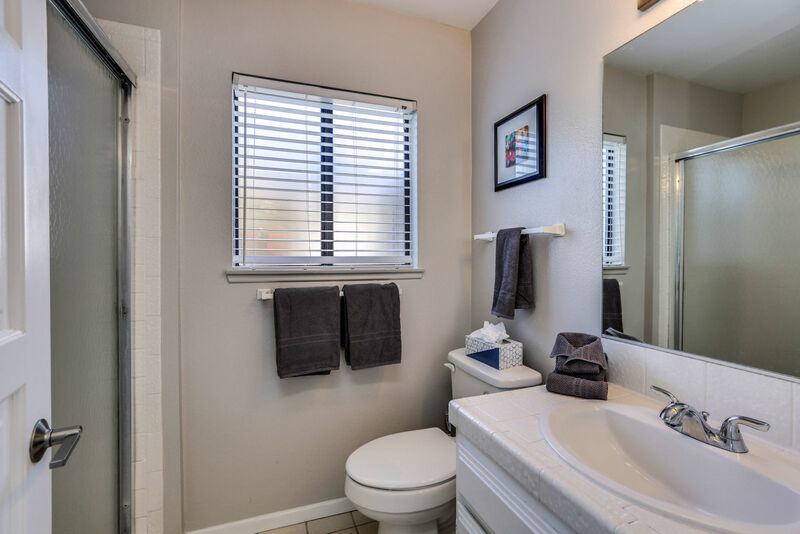 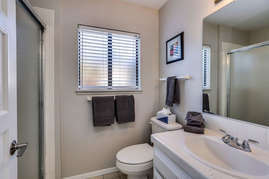 There are 2 guest bathrooms for the rest of the house to use at their leisure. 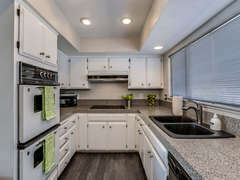 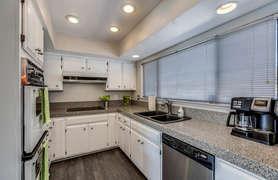 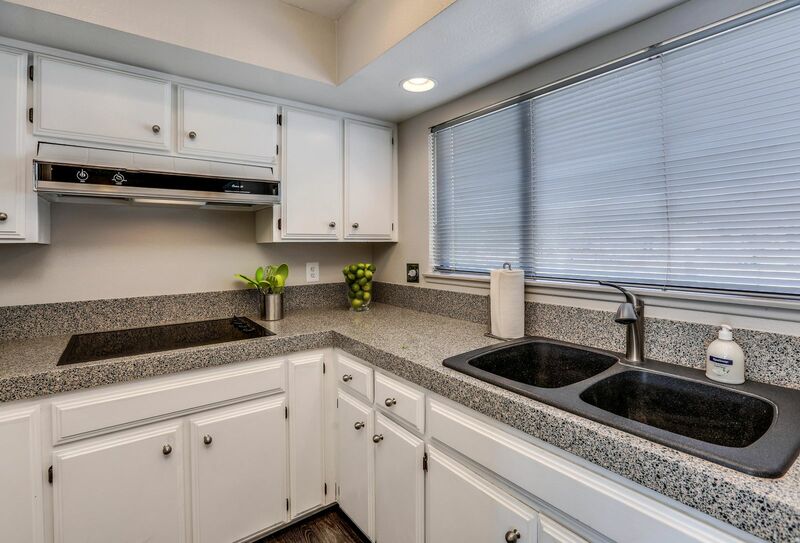 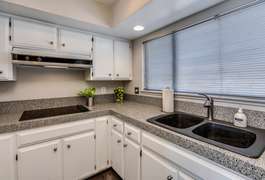 The well-organized galley kitchen blends classic white and stainless-steel appliances that make the design top-notch. 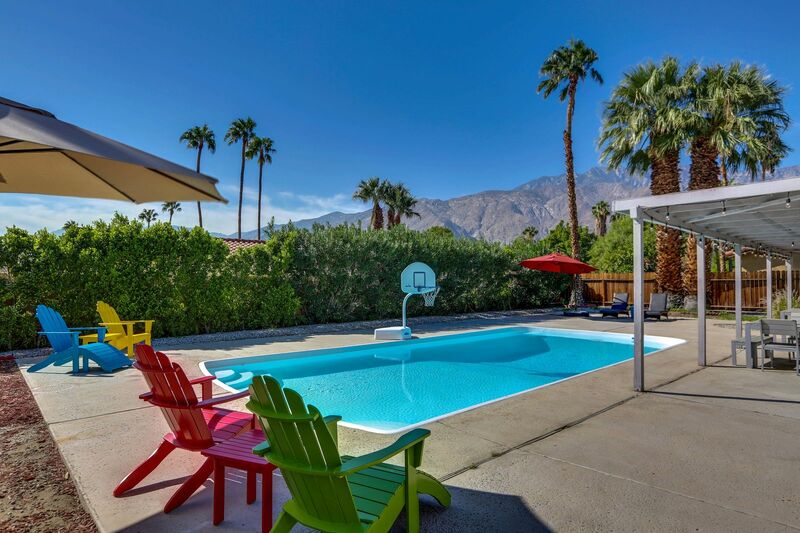 The colorful backyard meets you with a relaxing pool, fence, hedged walls and mountain views. There are vibrant chairs to chill, lounges to lay back and enjoy, a patio area with a dining area under a shaded area to block the sun where you and your guests can appreciate. 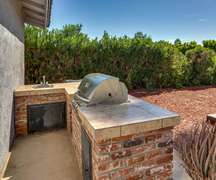 The bar bq grill is located in the backyard on an island. This attractive house is surrounded by a fence and has a 1-car garage and space for 3 cars in the driveway. 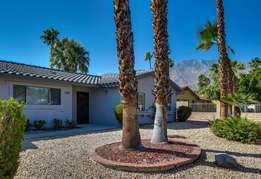 The front yard has well designed desert landscaping with decorative rocks and pebbles. 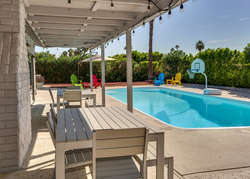 After a fun day by the pool, there is nothing like lounging in the backyard. 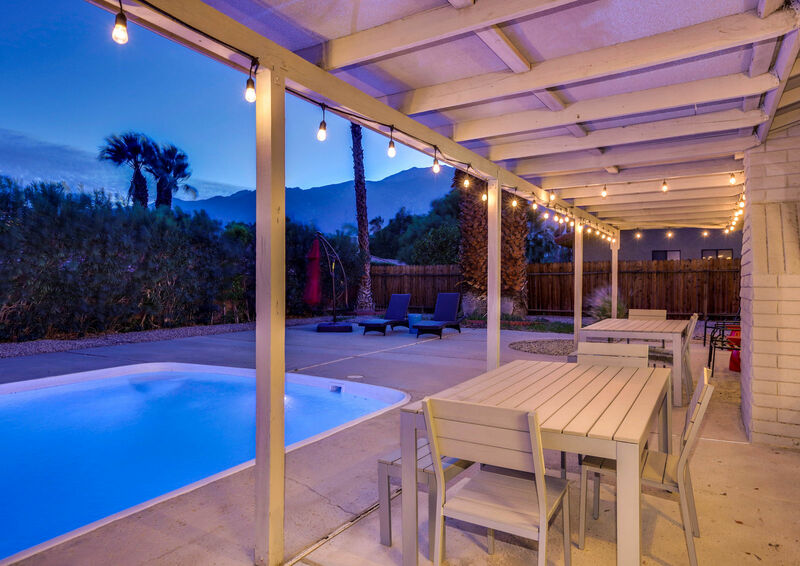 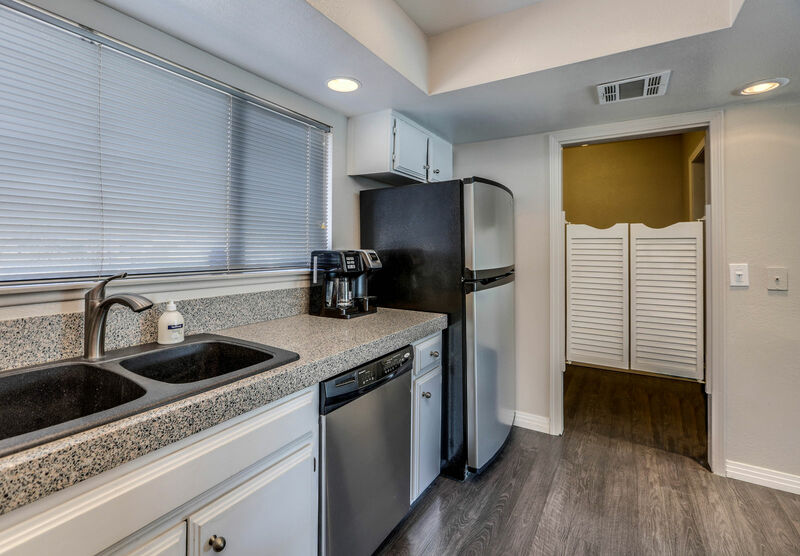 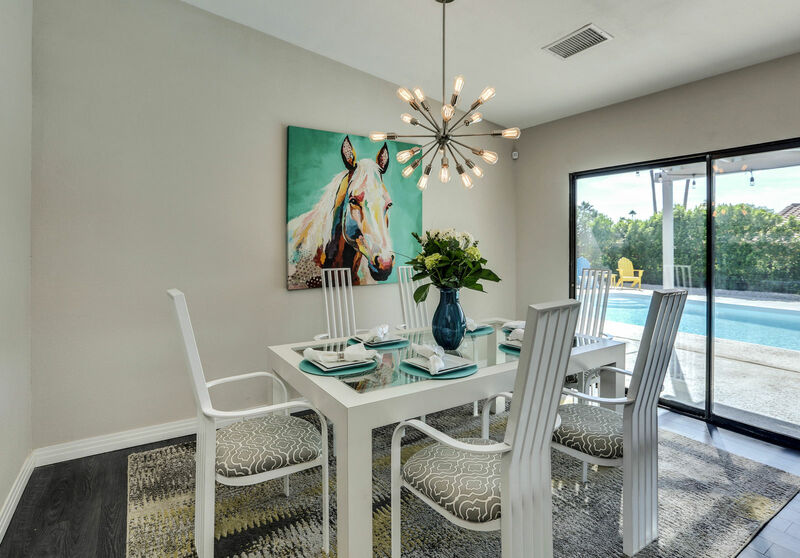 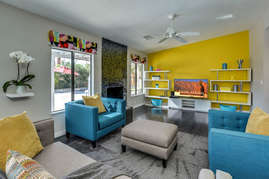 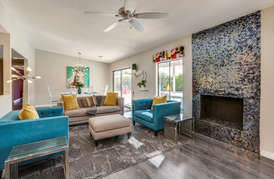 This Palm Springs vacation rental is near great restaurants, shopping and art galleries. 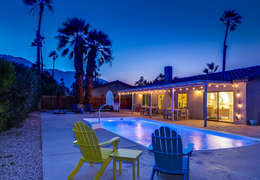 So book your Palm Springs Getaway today. For guests staying in private homes for 28 days or longer, you would pay a utility deposit of $1000 per month to cover the Gas & Electric Costs (pro-rated). The owner sends actual bills after departure. You are able to bypass city taxes of 11 - 11.5% with monthly rentals; depending on the city. Dog friendly but please see house rules for fees associated with bringing a dog. 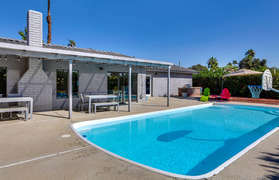 Baby items such as portable cribs rentals, can be rented through Desert Baby Rentals 760-861-6410 www.desertbabyrentals.com. The person whose name is on the reservation (considered the responsible party) must be present at the time of check-in and produce valid ID. 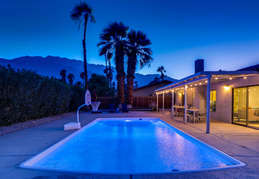 If the responsible party will not be present at the time of check in, a copy of your photo ID must be sent in 4 days prior to arrival to confirm identity and age. 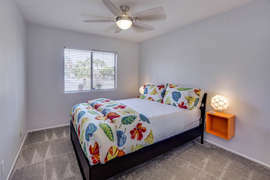 EVERYONE MUST BE 25 YEARS OR OLDER IN ORDER TO STAY AT ANY OF OUR PROPERTIES, unless the parents of the guests under 25 are staying at the house also.